Posted on 22, September 2016 by EuropaWire PR Editors | This entry was posted in Germany, Management, Marketing, Netherlands, Technology, Transportation & Logistics and tagged IAA, Sebastien Ruffino, TomTom, TomTom BRIDGE platform, TomTom Indoor for Enterprise. Bookmark the permalink. 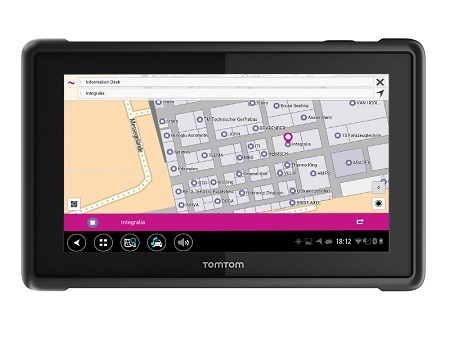 Hannover, Germany/ Amsterdam, The Netherlands, 22-Sep-2016 — /EuropaWire/ — TomTom (TOM2) today announced the availability of TomTom Indoor for Enterprise, highly detailed, accurate and customised indoor maps of public and private venues for site operators, facility and location managers. The feature will integrate with the TomTom BRIDGE platform, a ruggedised device that seamlessly connects business applications with TomTom’s navigation technology. It will enable users to increase efficiency, cost savings and an improve customer experience. TomTom Indoor maps entire facilities, both interior and exterior, to create enhanced location management. When used on the TomTom BRIDGE platform, logistics companies can support their drivers and operators’ navigation experiences all the way from the road network, through to the distribution warehouse terrain. That is, the private road network, access doors and interior infrastructure. TomTom Indoor for Enterprise maps can support applications ranging from location search and wayfinding to asset deployment and facility management. Utilising the TomTom Places map, via the TomTom BRIDGE platform, allows for seamless vehicle, pedestrian and indoor routing to take the user directly to the desired location within any building. This reduces wasted time finding locations and increases efficiencies leading to more work scheduled per day. The TomTom BRIDGE booth can be found in Hall 11, Stand C02, at IAA in Hannover.